Each area has it’s own score as well. 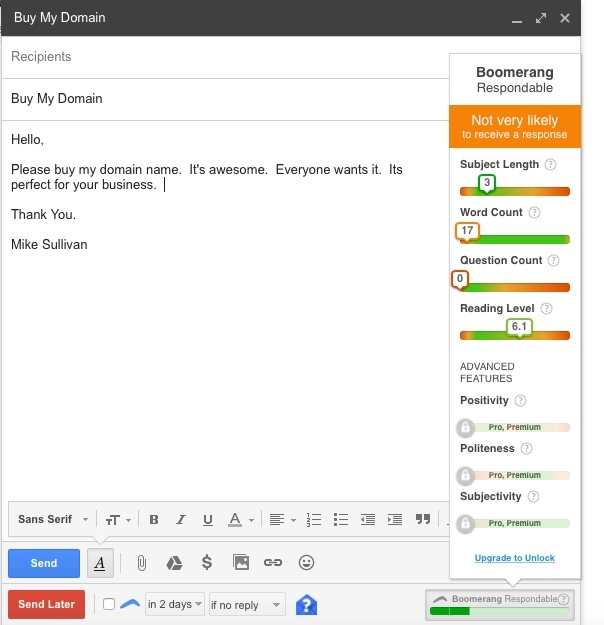 Upgrading will unlock some additional areas to further improve your email’s respondability. Clicking on the help symbol next to each area will provide more information on what is specifically being rated in that area. Does it work? I don’t really know how effective it is yet. 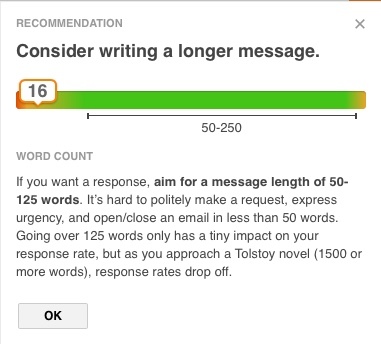 I haven’t sent enough emails using it to get a good feel. But I will continue eyeballing the meter as I type and see if I notice any major improvements in responses to my domain sales emails. Interesting! I don’t think I’ve ever used this before. I’ll have to at least check it out. @Eric, let me know what you think once you try it. Interesting, do you know other procuders offering the same ? It seems like the twitter kw recommendation tool , same principle, is it really using ai ? @Asset, Im not familiar with that Twitter tool, but I’ll check it out.